When I created Been There, Eaten That 6 1/2 years ago, it was because I had a deep and yes, obsessive love for DC dining. This is long before “Bon Appetit” names DC “Restaurant City of the Year.” In fact, at the time only a handful of restaurants were considered destinations for a truly exceptional meal. My, how times have changed. The Dabney in Blagden Alley is one of the restaurants notable for transforming DC into a city rich with options on the culinary front. 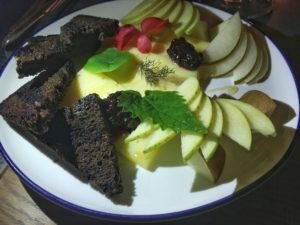 Chef/owner Jeremiah Langhorne makes Mid-Atlantic cuisine a thing, with his focus on dishes inspired by the historic food culture of the region. All ingredients are sourced locally, and part of the restaurant’s credo is sustaining personal relationships with farmers and purveyors. 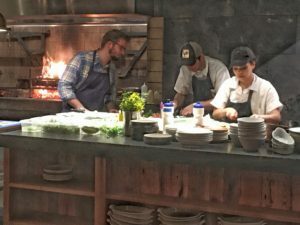 Nearly all dishes are cooked on a wood-burning hearth in an open kitchen, which lends an air of drama to the restaurant’s rustic feel with its reclaimed wood tables, pine floors, and brick walls. Chef Langhorne’s credentials include the popular McCrady’s in Charleston, SC, which provides a buzz from the start. Accolades have been growing, and The Dabney recently earned a Michelin star in DC’s first edition. Good news- you can make a reservation two weeks in advance. Not so good news- it’s not an easy one to obtain. I recently acquiesce to dine at The Dabney at 9:30 pm on a weeknight. The timing would normally be out of the question, but it’s one of a few farewell meals with my son before he moves to the Detroit area. We arrive at 8:00 pm, hoping for availability before our designated time slot. The place is filled to capacity, and so we duck into Columbia Room next door for a cocktail. This turns out to be the perfect warm-up to dinner at The Dabney. We barely finish our drinks before a text message informs us that our table is ready, which is actually seats at the bar. It’s earlier than planned, so no complaints. The menu opens with a selection of snacks. My son is pescatarian, so fried duck mortadella and whipped lardo are ruled out for their porky contents. We opt for fruit and cheese, which I usually enjoy after an initial bout of ambivalence. The Dabney plate is a stunner, and the cheeses from Seven Sisters in Pennsylvania are divine. Fruit, cheese, jam, and toast flow together in perfect harmony. Ciabatta is served with sorghum butter, and my son describes the flavor as reminiscent of pepperoni pizza. There was a time when that was his favorite, I think wistfully. The bulk of the menu is made up of small plates. After one too many frustrating dinners with family and friends who have diverging tastes and restrictions, I now routinely suggest to dining companions that we order at least one small plate to call our own. I’m finding this alleviates some of the stress of trying to find common ground on a menu, as well as determining how far a divided dish can go. My son and I adopt this approach with two vegetable dishes to share and one additional dish to hoard. Shaved winter vegetables arrive tucked under a blanket of lettuce that’s topped with creamy kimchi dressing, black garlic, lime, and benne seeds. 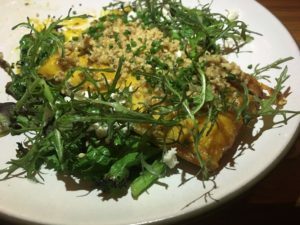 Winter squash with feta, walnuts and bitter greens has a flavor so intense and unique that it takes my breath away. I normally stay far away from walnuts, and in ordering a dish that includes them I anticipate brushing the nuts away. They are fully incorporated into the dish, so this isn’t an option. Somehow the coarse grind renders them appealing, and I enjoy the smoky earthiness of the dish so much that I deem it my favorite. At this point my son and I turn to our own dishes. 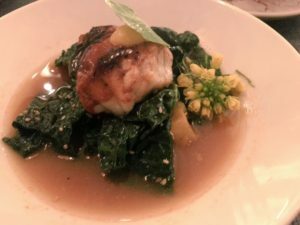 I immerse myself in glistening monkfish with sunchoke relish. The fish sits atop tangy charred greens, and bathes in a light spicy pork broth. It’s at this moment that I realize just how worthy the mid-Atlantic’s bounty is of this restaurant’s intense focus. My son dips into a fascinating bowl of ingredients adorned with leaves and greens. The contents include a poached farm egg, hearth-roasted brassicas, Hickory on the Hill cheese, and creamed turnip, sprinkled with a dash of nutmeg. We look up from our plates to nod and smile at each other every so often, and then hurry back to the assemblage of dishes before us. 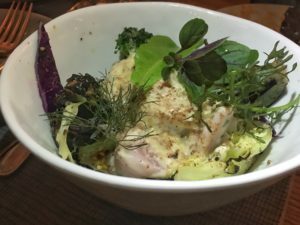 Chef Langhorne pays great tribute to the Mid-Atlantic at The Dabney, intertwining innovation with tradition in his dishes. We’re fortunate to have this restaurant in DC. As my son and his wife begin a new chapter of their life in the Midwest, I hope there’s a subtle message in this meal. Sometimes in looking forward, it’s important to also look back. At least for frequent visits.